Job consultant advice aside, I can think of three that could tie for the best job I ever had. Managing editor for my college newspaper: The editor got the editorial page and all the glory; the managing editor got all the responsibility for the rest of the newspaper. All the editors, reporters, and photographers reported to me. It’s a real-time adrenaline rush, five days a week: assigning stories, covering breaking news, finding myself in the middle of student protests (reporting, not protesting), getting calls from top university officials. I wouldn’t have a job of that level of responsibility and importance for another 15 years. Helping lead a corporate environmental revolution: I wrote a speech, and then another, and then another. A major environmental issue invited corporate change, and the company I was working for ultimately seized it. We turned the industry upside down. Executives inside the company accused the speechwriters of running the corporation. Who, me? What? The PR guy for an urban school district: It was a governmental upheaval—an outside management firm was brought in to restructure an urban school district. I was hired to be the communications guy. Think downsizings, school closings, massive organizational change, protests—all on top of the “normal” events at urban schools. I was in the news media several times a day, five days a week—and sometimes seven days a week. One TV station tracked me down one Saturday for an interview—at the car dealership where I was getting maintenance work done on my car. The reality is, the best jobs we’ve ever had can also be the worst jobs we’ve ever had. All three of those jobs I just listed would also make the “worst job” list. Excitement, constant change and adrenaline rushes can easily give way to burnout. But it was only when I started writing poems that I began to understand that good and bad, and best and worst, often walk hand in hand. I can’t explain why. It was likely because writing a poem is different from other kinds of writing (although it comes close to speechwriting—that is, good speechwriting). A poem can be ambiguous—it usually doesn’t leave you with answers but only more questions. And a poem requires you to look at a subject or a theme from a very different angle; you can shed more light or create fog where most people think clarity rules. going to love this place. So consider the best (and possibly worst) job you’ve ever had. 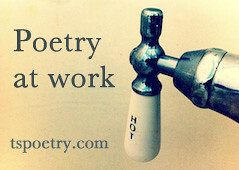 Write a poem. Share in the comments here or on your blog (and send us the link). We’ll feature some of them next week. Photograph by Fort Photo. Sourced via Flickr. Post by Glynn Young, author of the novels Dancing Priest and the recently released A Light Shining. Buy a year of happy work mornings today, just $5.99. In January we’re exploring the theme Coffee and Tea. I like your comment about being the managing editor for your college paper, that you wouldn’t have that much responsibility again for 15 years. That’s very thought-provoking. In my life there have been many jobs, Banks, Mortage & Loans, Store Management, Library at the local High School and then disability. Of all the many things I’ve done being Grandma means the most to me. It’s like having your kids all over again but being relaxed and having more fun. Doing it right and letting the little things get flung. It’s seeing a butterfly for the very first time or splashing in a birdbath and getting all wet. Pretending your riding a horse wearing a tupperware bowl for a hat. It’s laying on the ground hiding under a blanket playing peek-a-boo with the sun and never having to worry about getting things done. It’s a rock in a pocket, a secret not told, a cloud in the shape of a teddy bear, a sleepy head and a little voice. It’s fingerprints left on the glass door that you never wipe away, it’s a kiss goodbye and a big hug to because it’s the end of the day.